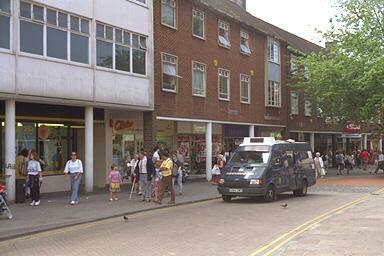 St. Georges Street leads down into the centre of the city. The area on the left here is at the end of a massive redevelopment, the archive images show the development. The church tower on the right is St.Georges Church, a remnant of the bombing. Christopher Marlowe, the dramatist was baptised in the church. Photograph June 1995. © Copyright Peter Collinson, All rights reserved.